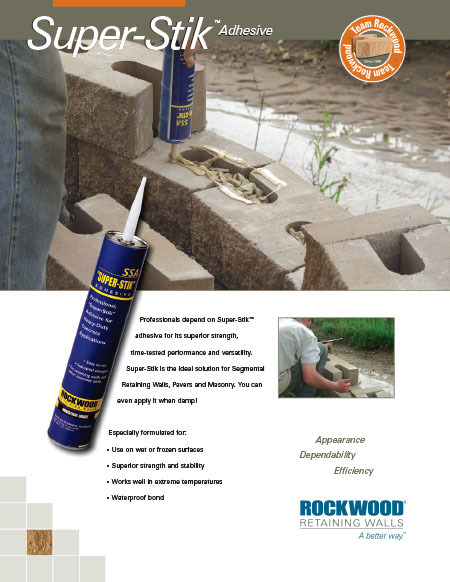 The lower profile of Classic® 6 provides a longer, smoother appearance while maintaining all the special features of the Rockwood Classic family of products. Appealing to homeowners, contractors, and designers, Classic 6 is as flexible as it is versatile. 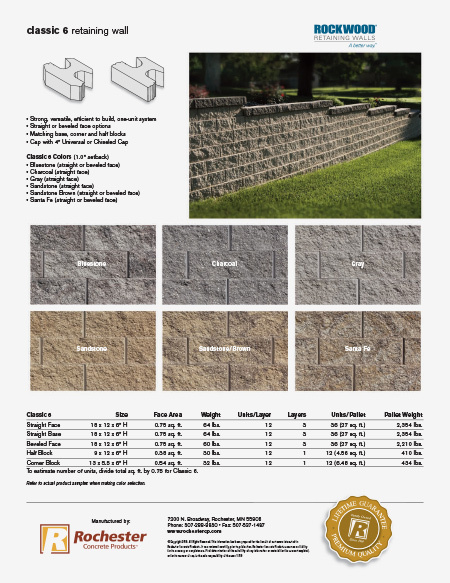 Capable of sharp radius turns, variable setbacks, and endless design possibilities, Classic 6 is the perfect block for any retaining wall project. 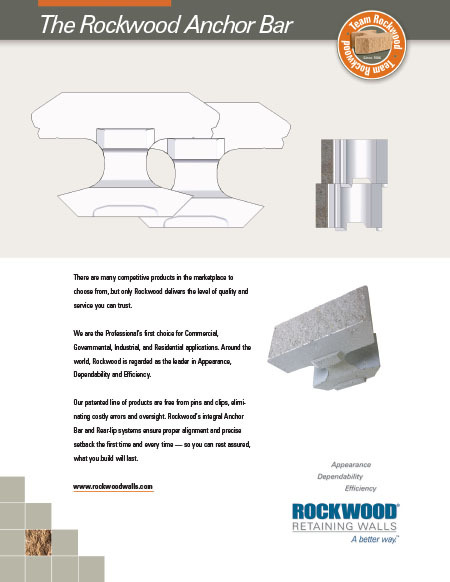 The number "6" after the product name refers to the height of the block in inches. This helps to differentiate between the two types, 6 and 8. Straight Face 18 x 12 x 6" H 0.75 sq. ft. 64 lbs. 12 3 36 27 sq. ft. 2,354 lbs. (Base Block) 18 x 12 x 6" H 0.75 sq. ft. 64 lbs. 12 3 36 27 sq. ft. 2,354 lbs. Beveled Face 18 x 12 x 6" H 0.75 sq. ft. 60 lbs. 12 3 36 27 sq. ft. 2,210 lbs. (Base Block) 18 x 12 x 6" H 0.75 sq. ft. 60 lbs. 12 3 36 27 sq. ft. 2,210 lbs. Half Block 9 x 12 x 6" H 0.38 sq. ft. 30 lbs. 12 1 12 4.56 sq. ft. 410 lbs. Corner Block 13 x 5.5 x 6" H 0.54 sq. ft. 32 lbs. 12 1 12 6.48 sq. ft. 434 lbs. Available by layer or pallet. Limited quantities of Classic 6 in Monterey and Brown, call for availability. To estimate number of units, divide total sq. ft. by 0.75.